Meet the Muzetto Outback. This is your "pick me up and throw me wherever you'd like" kind of bag. It's got a rough "who cares" exterior straight from a dusty western flick, and a lovely caring interior to keep all the essential gear of the tech savvy. The Muzetto Outback brings back that famous Indiana Jones scruffy look with a mix of modern style for urbaners looking for some adventure in the concrete jungle. If you've ever had your eyes set on WaterField's original leather Muzetto, the Outback is sure to be on your gear bag wish list. Jump over the break for the full review! WaterField's bevy of bags and sleeves were all a hit as far as we know it. Like all of WaterField's handmade products, the Muzetto Outback comes in five different sizes with large enough capacities to fit up to a 15-inch MacBook Pro and select laptops. This particular Outback that we're reviewing is of the 10-inch Portable variant which will set you back $159 and is ideal for carrying an iPad or any other tablet. That's a pretty price to pay, albeit the leather version will run you $199. Both are made to order for the time being. The Muzetto Outback is a waxed, cotton canvas bag that can only look better and better as time progresses. It feels rough like an unwaxed pair of jeans with a very similar texture to it. That waxed canvas will not only do a good job at repelling water that'll add some rain durability, but it builds character from daily use just like the naturally tanned leather Muzetto. And for that, the Outback is especially great for casual wear. In many ways this bag is identical to its leather counterpart we reviewed a while back, but at a more affordable price. The interior is your standard Muzetto while the exterior sports a tanned, waxed cotton canvas material with the same contemporary design. Not much has changed other than it being slightly less heavy, so in other words the Muzetto Outback is still the same terrific gear bag that has personally won me over. The Muzetto Outback is everything we've come to expect out of WaterField. The build quality is top notch. 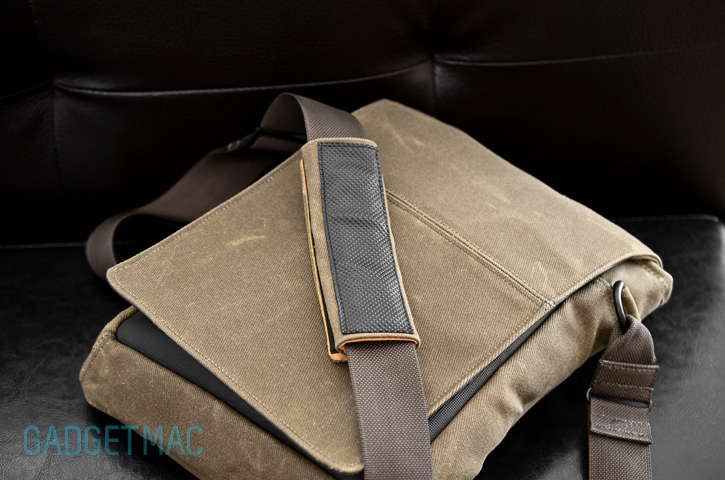 And the waxed canvas together with the ballistic nylon interior makes up for an extremely durable bag that'll take a rough beating but will still look just as beautiful as the day you unwrapped it from its packaging. While you cannot pick the color of the Outback's tanned waxed canvas, you can pick from six different ballistic nylon accents that can be seen peeking behind the flap. 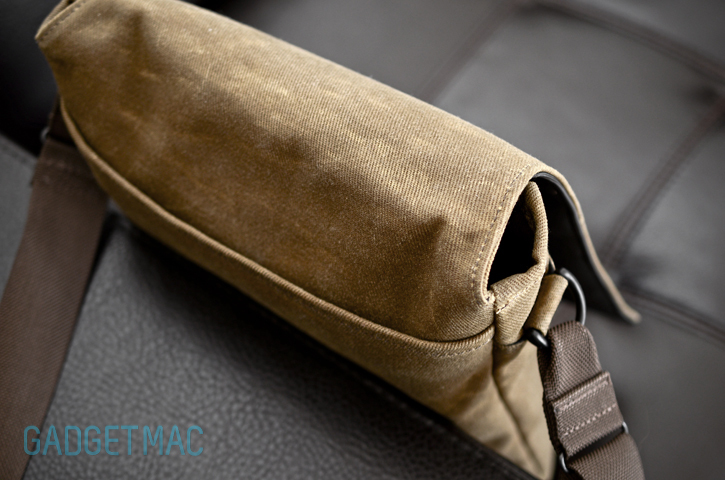 Before we go over each and every compartment, comfort is of great importance when it comes to a shoulder bag. The Muzetto Outback's adjustable should strap and padded shoulder pad along with articulating D ring hinges make for a pleasant and comfortable carry experience throughout the entire day. When wearing the portable Muzetto I tend to always wear it across my body using the shoulder strap and never just hanging off of one of my shoulders. But what makes it even more of a convenience is the way the should pad has been designed in a way that it grabs a hold of your shoulder with its grippy textured surface and allows the strap to freely move about and thru it. When you're wearing a Muzetto bag across your body and have the bag off to your side, when the time comes to reach and access one of the compartments, you can easily slide the bag to the front of you with a fluid swooshing motion while not having to worry about the shoulder strap pad falling off or popping out of its comfortable position as I'd imagine happens quite often with many shoulder style bags. With no zippers, locking mechanisms to get in the way, reaching your personal stuff couldn't be any quicker. The front flap reveals the large comportment suitable for perfectly storing and iPad, iPad 2 or iPad 3rd Gen with or without a protective case, sleeve or Smart Cover while having enough spare room even for a pair of portable headphones and then some. Although there's little keeping the flap from opening up, it is weighted down and does a good job keeping your things safely stored inside. Once you get used to the idea of never having to unzip your bag, you'll never want to go back. 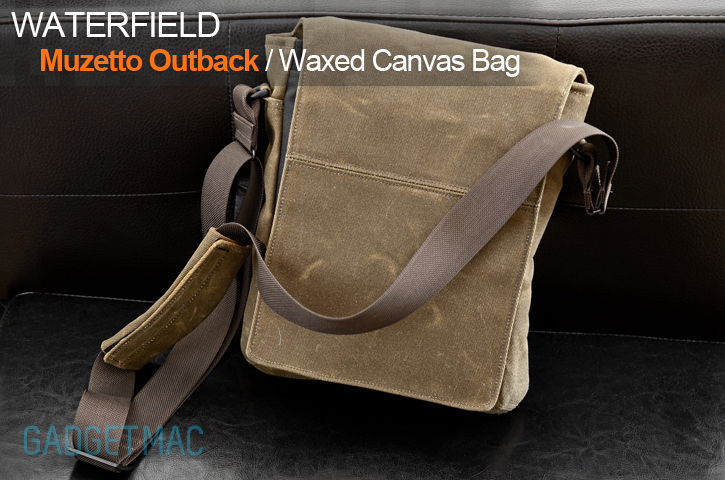 WaterField took the time to insure this would work perfectly, and so it shows. The 10-inch Portable Muzetto Outback may be on the verge of looking like an oversized murse, however it has just the right amount of internal pockets and capacity to make you take only what really matters with you on the daily commute. Alongside the large compartment is a smaller pocket that runs deep and is the only pocket that is secured with a zipper for those extra small important things you want to keep safe like your wallet. Again, we see that amazing bright orange interior nylon lining in every pocket that helps with visibility in finding those little things tucked deep within. It may be a negligible feature, but it's that amount of attention to detail that the Muzetto bag bares that makes it a solid performer at the end of the day. 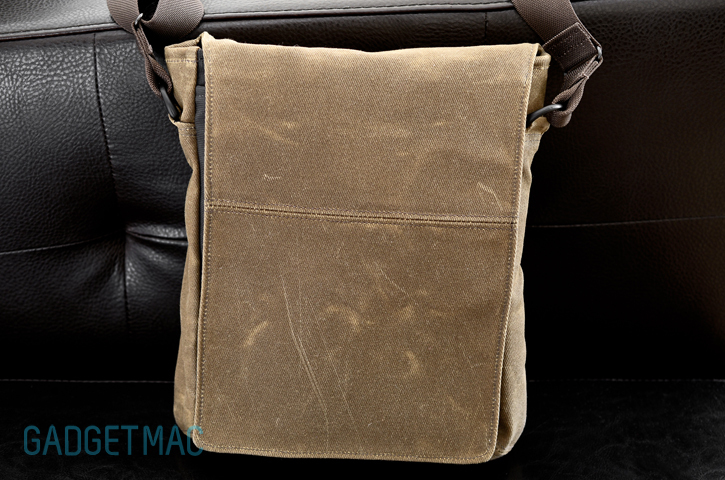 Last but certainly not least is the back side of the Muzetto Outback, where you will find the final compartment best suitable for a few magazines or even an iPad 2 or iPad 3rd Gen with or without a Smart Cover. That'll leave you with even more space to utilize the largest compartment for larger things. It's a slip it slip out sort of pocket that doesn't have any velcro tab to keep it shut. The addition of such a closure tab would have been ideal though. To give you a better example of what exactly one could fit inside the portable size of the Muzetto - here's a "what's in my gear bag" best case scenario. Typically this is what I'd be carrying with me when I don't need my MacBook Air around or have a big enough camera gear bag that holds more than I can chew. 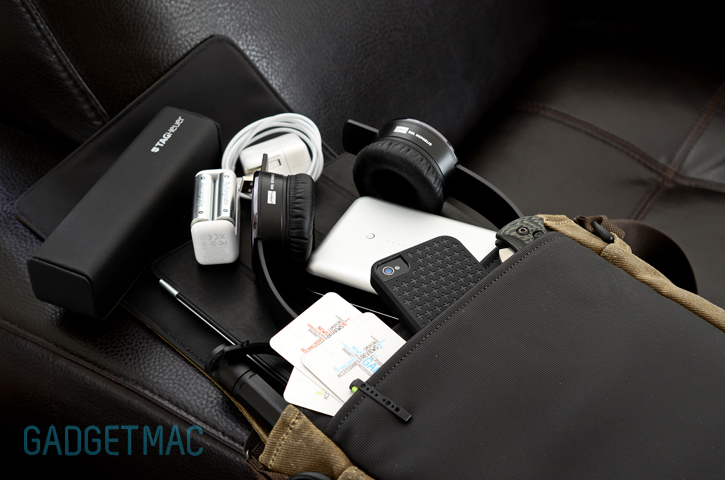 An iPad 3rd Gen with a leather Smart Cover slips into the large main compartment along with a portable pair of Sol Republic Tracks headphones (anything larger will not fit with such a combination), a large Just Mobile Gum Max battery backup pack because you can never have enough energy juice for these gadgets, a few chargers and cables, a hard eyewear case, a handy Inova X5 LED flashlight, a Benchmade folding knife, a Ten One Design PogoSketch stylus, some business cards and an iPhone 4S snuggly fit inside the designated padded pocket. All of this gear fits in just right, though I'd recommend going up one size if you plan on adding a bit more than this. After thoroughly spending time with the Muzetto Outback, I did run into a single questionable drawback. While the waxed canvas and ballistic nylon interior will handle a run-in with rainy day for a short period, there's a caveat here worth noting. You'll notice that on either ends of the top opening have a little bit of open space that will end up letting some rain thru, and that's not good if you live in parts of the world with plenty of rainy days. Unfortunately, the flap isn't able to fully cover and seal the opening leaving those two sides and your gear inside slightly exposed to the elements. Granted these bags do take some time to fully break in and give out their stiff nature for more flexibility, however, I've yet to reach that stage. In closing, the Muzetto Outback is a brilliant bag with high quality standards to boot. Not everyone can pull off rocking this bag. However, if you see yourself as a daring, modern Indiana Jones person, this bag is the one you should definitely consider. The Muzetto Outback is a down to earth, gritty yet simplistic and a straight shooter throwback to what was then a staple of canvas shoulder bags. With that said, this might not be the best gear bag for you if weather-resistant is of high priority. At its highest selling price of $189, the Outback comes highly recommended.